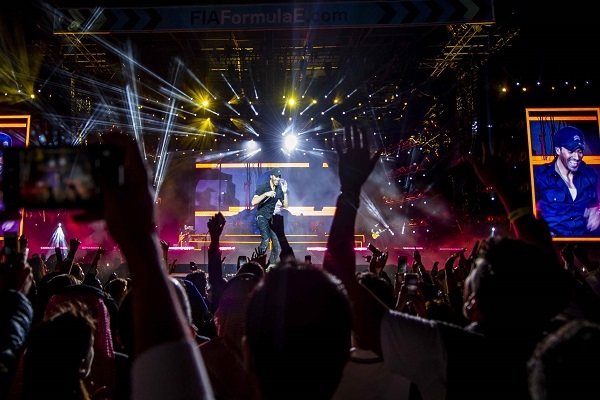 Global music stars Jason Derulo and headline act Enrique Iglesias have made history by performing to a crowd of excited music fans in Saudi Arabia as the lights turned green for the Formula E festival of fun surrounding the 2018 ‘Saudia’ Ad Diriyah E-Prix. First up on stage was American R&B star Jason Derulo, who belted out global hits in an unforgettable performance, befitting the start of the biggest line-up in sport, live music, entertainment and cultural activities ever staged in the Kingdom. Followers of pop music were then treated once again as ‘Tonight’ belonged to the King of Latin Pop, Enrique Iglesias who entertained local and international fans with his catchy anthems. Covering songs across his broad catalogue which has sold 170 million albums worldwide, Enrique offered music lovers something old and new with hits like ‘Bailamos’ and ‘Hero’ and ‘Heartbeat’. Next up on the Saudia Ad Diriyah E-Prix stage tonight (December 14) is Hip-Hop, Pop & Dance royalty, The Black Eyed Peas along with Egyptian singer/songwriter Amr Diab. Doors open this Friday, December 14, at 2pm to exciting fan zones, entertainment and cultural attractions, plus unique dining and retail experiences for Formula E ticketholders at Ad Diriyah. Concerts start at 7:30pm both Friday and Saturday. Single-day tickets for today for SR330 are still available at http://fiaformulae.com/Ad-Diriyah, as well as three-day tickets which allow fans to catch the two remaining days of entertainment, including the complimentary concerts for Formula E ticket holders. Today will also see action on the amazing race track created at Ad Diriyah with the launch of the all-electric production car racing series, the Jaguar I-Pace eTrophy. Fans can watch drivers from this exciting new tournament compete in qualifying sessions ahead of their own final on December 15. And, after a day of Formula E action on the track at the 2018 ‘Saudia’ Ad Diriyah E-Prix, tomorrow evening fans will be treated to a double-header of sensational acts with US and French music heroes OneRepublic and superstar DJ/producer David Guetta headlining the biggest night of the three-day festival.